He was short (<160 cm), probably lactose intolerant, had an exceedingly long melon (cranial index = 72.6), and belonged to mtDNA haplogroup K2a. In other words, he was a typical Neolithic farmer, and clearly different from the average modern-day inhabitant of the North European Plain. No doubt, his people were largely replaced by newcomers from the east and also west during the frequent population shifts in the region after the Neolithic (see here). However, the stable isotope analysis suggests that he ate a lot of millet, which is known as a typically Slavic cultigen in Europe. ABSTRACT: In 2007 a ceremonial complex representing the Globular Amphora Culture was discovered in Kowal (the Kuyavia region, Poland). Radiocarbon dating demonstrated that the human remains associated with the complex are of similar antiquity, i.e. 4.105 ± 0.035 conv. and 3.990 ± 0.050 conv. Kyrs. After calibration, this suggests a period between 2850 and 2570 BC (68.2% likelihood), or more specifically, 2870 to 2500 BC (95.4% likelihood). Morphological data indicate that the skeleton belonged to a male who died at 27–35 years of age. The unusual morphology of his hard palate suggests this individual may have had a speech disorder. Stable oxygen isotope values of the individual's teeth are above the locally established oxygen isotope range of precipitation, but due to sample limitations we cannot conclusively say whether the individual is of non-local origin. Stable carbon and nitrogen isotope ratios were analyzed to reconstruct the diet of the studied individual, and show a terrestrial-based diet. Through ancient DNA (aDNA) analysis, the mtDNA haplogroup K2a* and lactose intolerance as evidenced by homozygous C-13910 allele were identified. 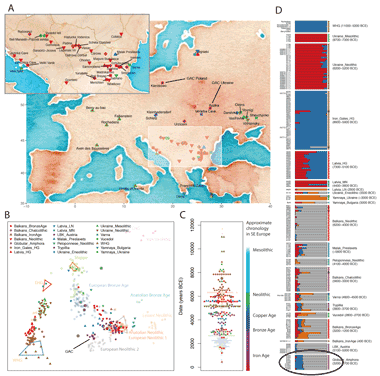 These aDNA results are the first sequences reported for an individual representing the Globular Amphora Culture, enriching the still modest pool of human genetic data from the Neolithic.